You don’t have to travel to a Harry Potter theme park to enjoy Butterbeer! Here’s how you can make it at home, with just a few ingredients. Do you ever wish that you could visit the magical lands that you read about in books? I’m kind of obsessed with fictional stories, and my imagination can get a bit carried away while I’m reading. This usually means that when one of my favourite books gets adapted into a film, I’m disappointed by what I see on the screen. Luckily, this wasn’t the case with the Harry Potter films. The sets and scenery were very close to what I had imagined – which I’m sure is largely due to the fact that J.K. Rowling is a wonderful writer. I loved being able to immerse myself into her magical world through both the books and the film. So when a Harry Potter themed Island of Adventure opened in Florida, I was excited! I would actually be able to see that world in real life! You can even taste some of the Harry Potter foods at the park, including a frothy chilled version of Butterbeer! That attraction opened in 2010, and since then two more Harry Potter attractions have opened up (with a fourth under construction). And I haven’t visited any of them. Sadly, traveling to see those attractions just hasn’t been in my budget. Also, deep down inside I think I’m afraid that I will be disappointed. My last trip to Disneyland was underwhelming, filled with hours spent waiting in line and fighting through crowds. That just isn’t my idea of fun. So maybe I’m better off sticking to my book and films, and making my own version of the Harry Potter treats. Besides, a friend told me that he got seriously ill after drinking the frozen Butterbeer at the park, so maybe I dodged a bullet there! 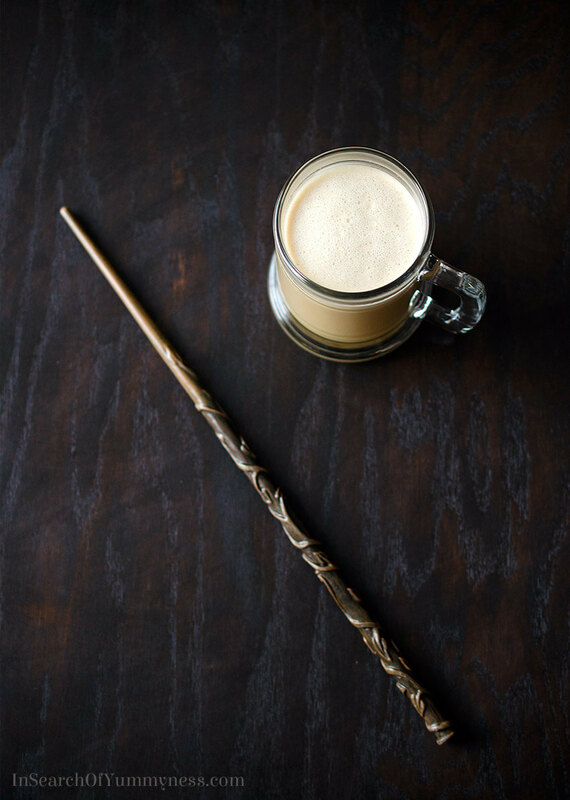 Have you noticed that the flavour of Butterbeer isn’t written anywhere in the Harry Potter books? It’s left to your imagination – and I’ve always imagined that it would be something like a frothy hot toddy! That’s what I had in mind when I came up with this recipe. I started with buttered rum for the base, but I didn’t want to put actual butter in the drink. So I replaced the butter and sugar with this homemade butterscotch sauce recipe from my friend Karyn (which you will want to eat on everything because it’s delicious!). That took care of the “butter” part. I also didn’t want to use actual beer in the drink. So I opted for an old-fashioned cream soda to add fizz and caramel flavour to the drink. You could use a clear cream soda, but I prefer the flavour of a dark cream soda like Virgil’s Cream Soda. The mixture tasted good, but it was missing something. And it didn’t have any froth on top! To fix this problem, I added a little bit of vanilla ice cream, which not only added some foam but also rounded out the flavour of the entire drink. Success! This indulgent drink can be made with or without alcohol. It's delicious either way. Warm the mixture in the microwave for about 30 seconds, then add the ice cream. Substitutions: If you cannot find Virgil's Cream Soda, try to use another artisan or craft cream soda. You need a brown/caramel coloured cream soda to get the best taste - pink or clear cream sodas do not work as well here. Alcohol warning: Please do not serve alcohol to children, pregnant women and others who should not consume it. If you choose to drink, do not drive. This is not a sponsored post. This post contains Amazon affiliate links. Ok – this may have to replace my usual Xmas morning drink! Yum! Hey Amanda, it was nice to meet you too! The conference went by so quickly!! I totally agree with you about the vanilla! Virigil’s Cream Soda is actually made with vanilla beans, so it add vanilla flavour to the drink. The vanilla ice cream also helps lol. Oh how I love Harry Potter! <3 This is the perfect drink for fall and winter, love it!!! 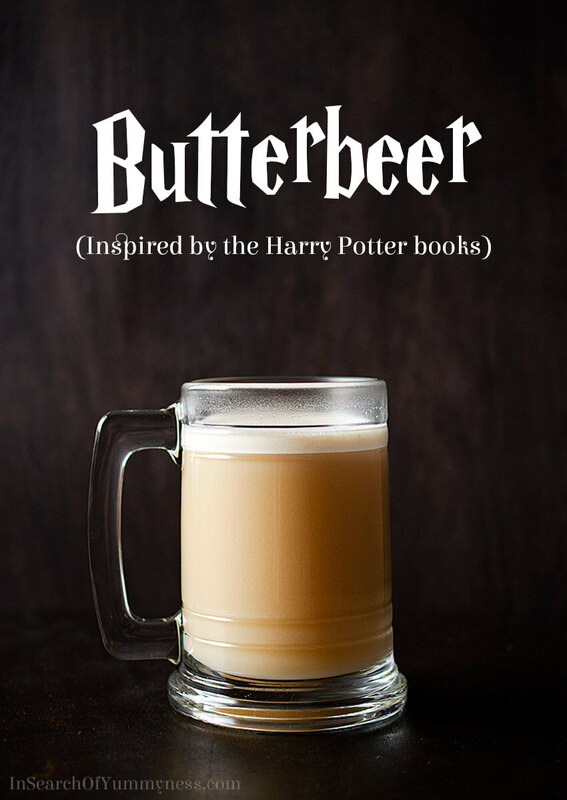 I have never made butterbeer, but this looks awesome! Thanks so much for using my butterscotch recipe in it. It is an magical elixir! Your butterscotch recipe is SO MUCH BETTER than the store-bought stuff! It worked perfectly in this drink! This looks so delicious! 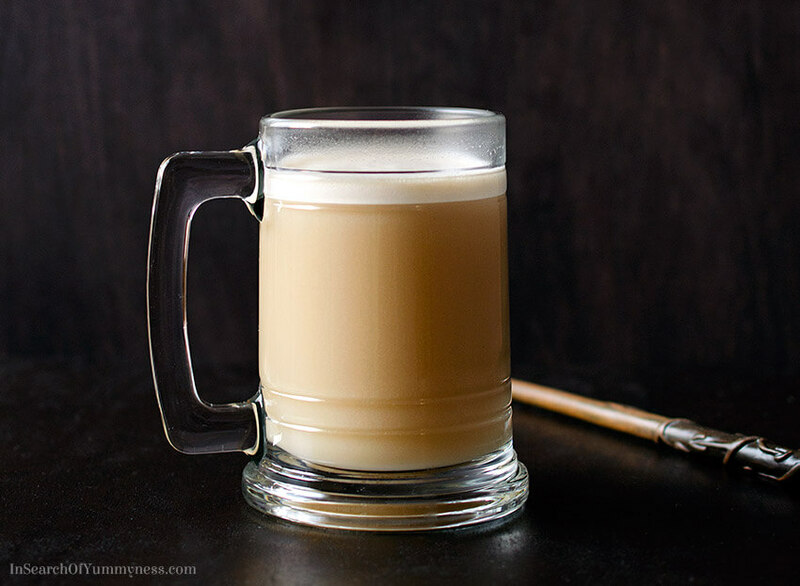 I’ve been wanting to try a Butterbeer recipe! My husband and I will have to make this next time we binge watch HP! Thanks Logan, I hope you do try it!